I had a dilemma. A food dilemma, my favorite sort. I love muddy buddies (or puppy chow, if you prefer). And I had an easter event coming up that I promised to deliver food to. But I couldn’t just serve PLAIN puppy chow at an Easter event! It’s all brown and white…not at all bright and pastel! 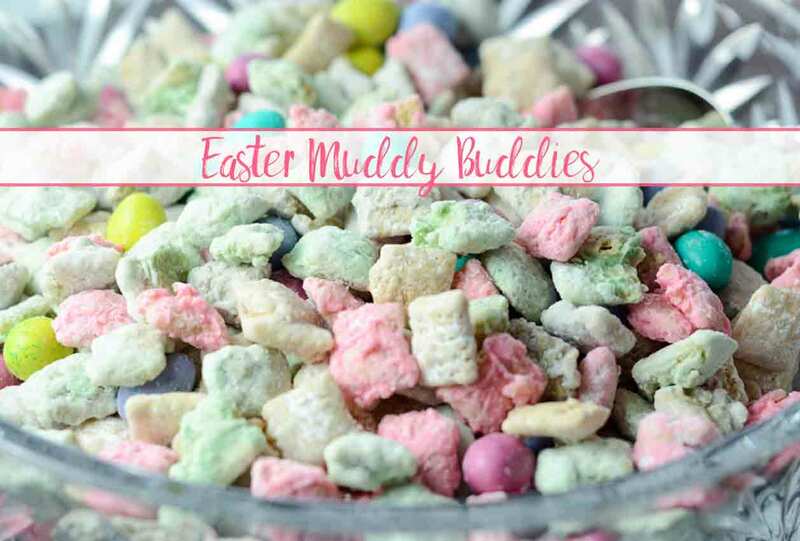 So I decided to take matters into my own hands and make my own Easter Muddy Buddies. 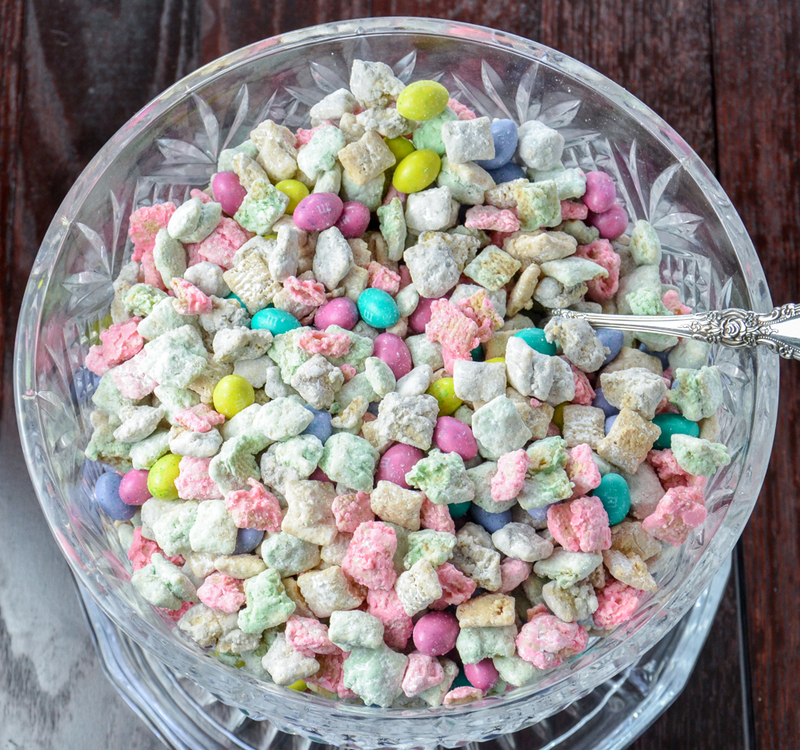 Question for you, my dear reader: Next month I’m going to try out a new muddy buddies recipes. What would you guys like to see? Cookies and cream? Andes mint? Apple Pie? Twix? Cinnamon Roll? Please comment below letting me know! This is pretty much like normal muddy buddies. 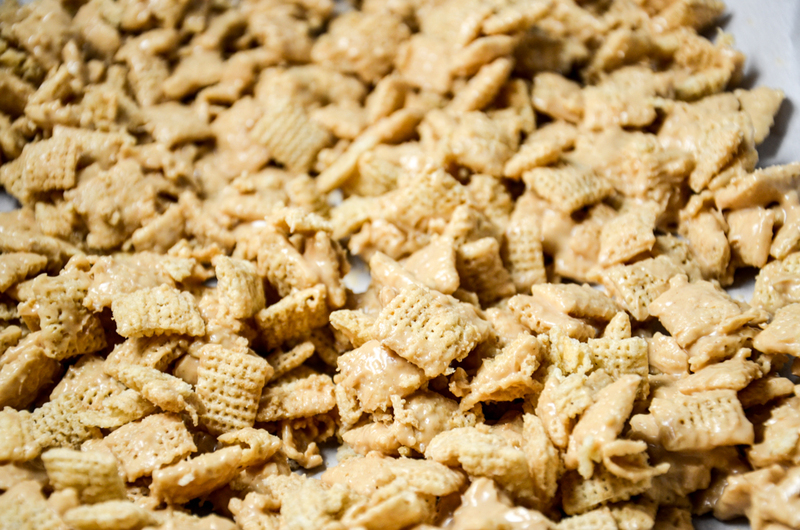 Except after coating in the peanut butter/butter, you’re going to spread out the cereal to dry. Then toss in the various colored pastel candies before tossing in powdered sugar. 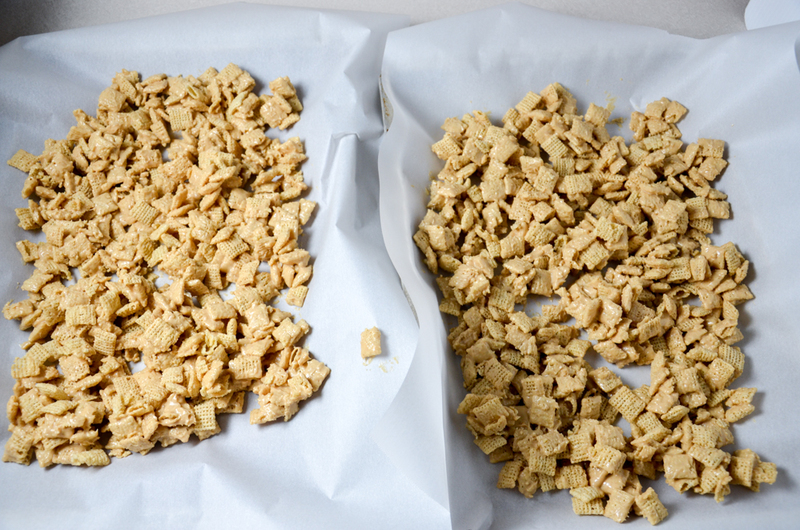 Lay out peanut butter coated cereal to dry before dipping in chocolate. You don't have to break it all up, some small clumps are okay. Pour cereal into a very large mixing bowl and set aside. Melt white chocolate, peanut butter, and butter in microwave. Heat at 50% power for 30 seconds at a time, stirring in between each time (chocolate scorches easily, so be careful! 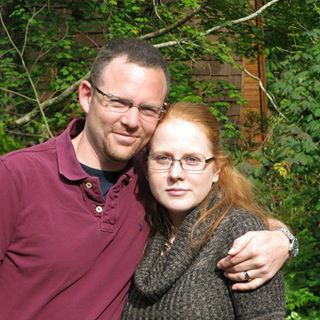 ), until everything melted. Pour mixture over cereal. Mix well, but gently (try not to break too much cereal). Spread out onto two large cookie sheets (use parchment paper if desired to prevent sticking) and allow to cool for 15 minutes. Divide cereal into 4 parts. Take 1/4 of total mix, put in Ziploc bag, and toss with between 1/4 & 1/2 C. powdered sugar, until well-coated. May have to unstick larger clumps. Spread out onto separate sheet to finish drying. Melt pastel pink candy melts (heat at 50% power for 30 seconds at a time, stirring in between each time). Take another 1/4 of cereal mixture and pour melted pink candy over it. Stir with spoon until well-coated. Put in Ziploc bag, and toss with between 1/4 & 1/2 C. powdered sugar, until well-coated. May have to unstick larger clumps. Spread out onto separate sheet to finish drying. Melt pastel green candy melts. Take another 1/4 of cereal mixture and pour melted green over it. Stir with spoon until well-coated. Put in Ziploc bag, and toss with between 1/4 & 1/2 C. powdered sugar, until well-coated. May have to unstick larger clumps. Spread out onto separate sheet to finish drying. Melt pastel purple (or another color of choice) candy melts. Take another 1/4 of cereal mixture and pour melted candy melts over it. Stir with spoon until well-coated. Put in Ziploc bag, and toss with between 1/4 & 1/2 C. powdered sugar, until well-coated. May have to unstick larger clumps. Spread out onto separate sheet to finish drying. Merkens is the absolute best quality candy melts. Trust me, I’ve tested them all. You may have to order them online. If you can’t get them, Wilton is second best. You’ll have to thin them with paramount crystals or a bit of shortening, though.